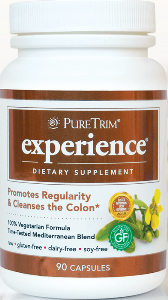 • A healthy colon is the key to nutrient absorption and regularity. • This Mediterranean recipe is a natural vegetarian blend. for Nonprescription Drugs and Dietary Supplements. Experience contains a proprietary blend of Senna (leaf), Psyllium (Blonde) Seed Husk, Fennel (seed), Kelp (entire plant), Cornsilk (stigmas), Polygonatum (many-flower Solomon's seal) [rhizome], Chinese Rhubarb (root). Take one capsule with a full glass of water before bedtime. Increase your serving size by one capsule every other day until you achieve your desired results. Do not exceed 3 capsules a day unless directed by a health practitioner. Drink 6 to 8 glasses of water throughout the day. *You can also take this as a tea. Just empty the capsule into hot/warm water. Add natural honey for flavor.